My world was rocked recently when I discovered I liked sauerkraut. Who knew fermemted cabbage could taste so goddamn good?! I certainly didn’t and I had turned my nose up at the sight of sauerkraut on many occasions. However last month my body randomly had a craving for sauerkraut so I rolled with it. I ate so much sauerkraut you wouldn’t believe. It made my belly feel lighter as the pro-biotic goodness worked its magic in my stomach. However one undesired side effect was on my wallet. It felt lighter too. Organic raw sauerkraut doesn’t come cheap. A 400g jar of this deliciousness retails for around £4.00 which is pretty steep in my opinion. 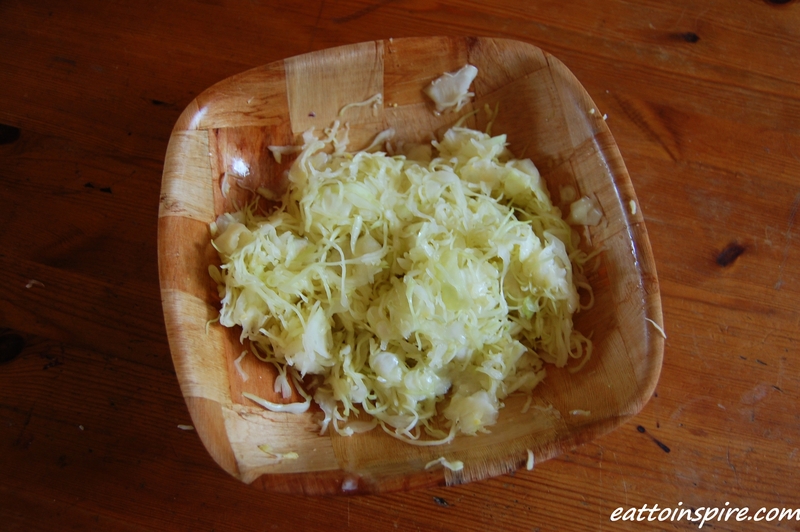 I knew it was easy and possible to make your own sauerkraut at home, however all that fine chopping of cabbage didn’t appeal to the lazy part of my bones. 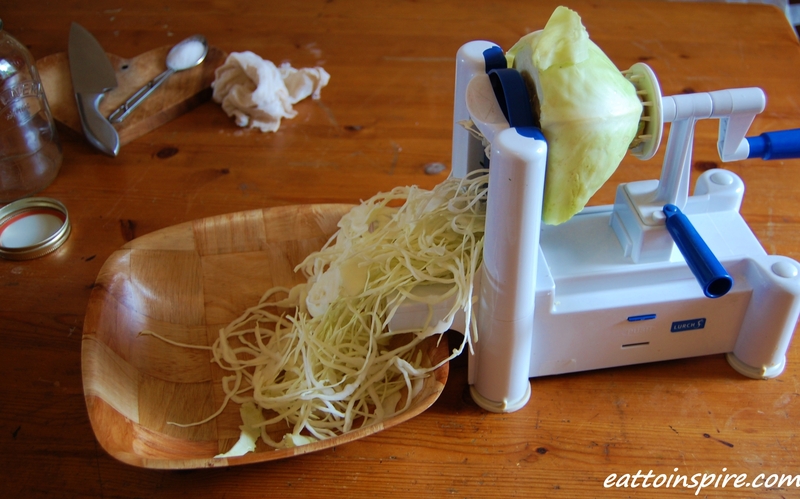 If only there was an easier way to make sauerkraut…! I got my grubby mitts on a very small organic cabbage and some sea salt and I set to work making my lazy-person-sauerkraut dreams come true. Want to know how I did it?! 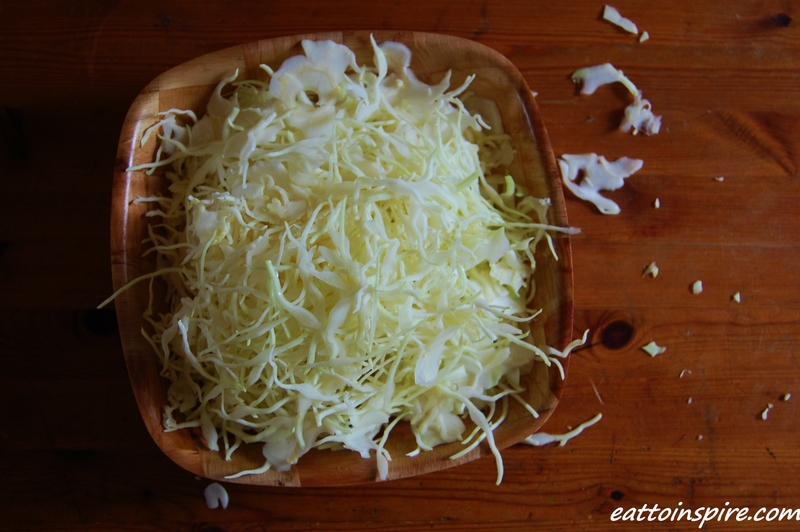 Firstly put your cabbage into your spiraliser and get spiralising! 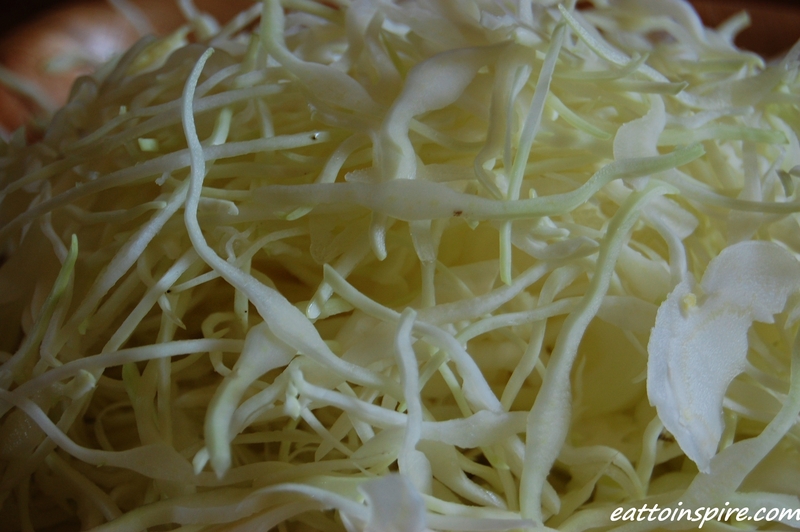 You will very quickly have a giant bowl of beautiful perfect shredded cabbage. 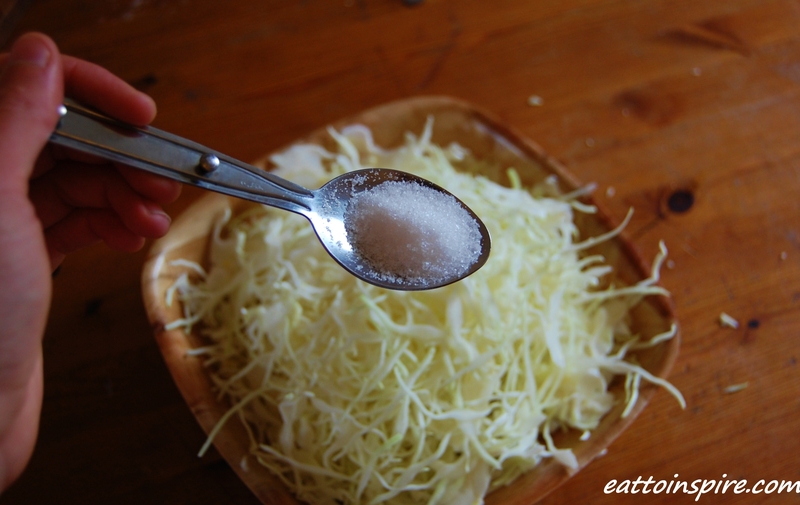 Add 1/2 tbsp of salt per 500g of cabbage. Get your hands in there and massage the salt into the cabbage for a few minutes until the cabbage juices flow. Place the juicy cabbage into your big jar and press down as much as you can. Then fill your smaller jar with water and press it into the cabbage so that the cabbage becomes submerged below the liquid (this is very important). Cover with a clean muslin cloth and leave for a minimum of 2 weeks. 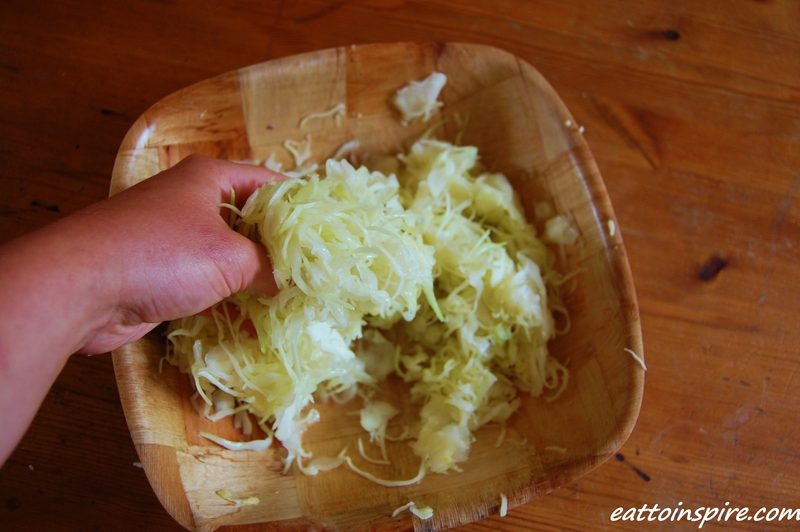 How do you make your sauerkraut? What flavours do you like to add? Do you have any other food related life hacks? 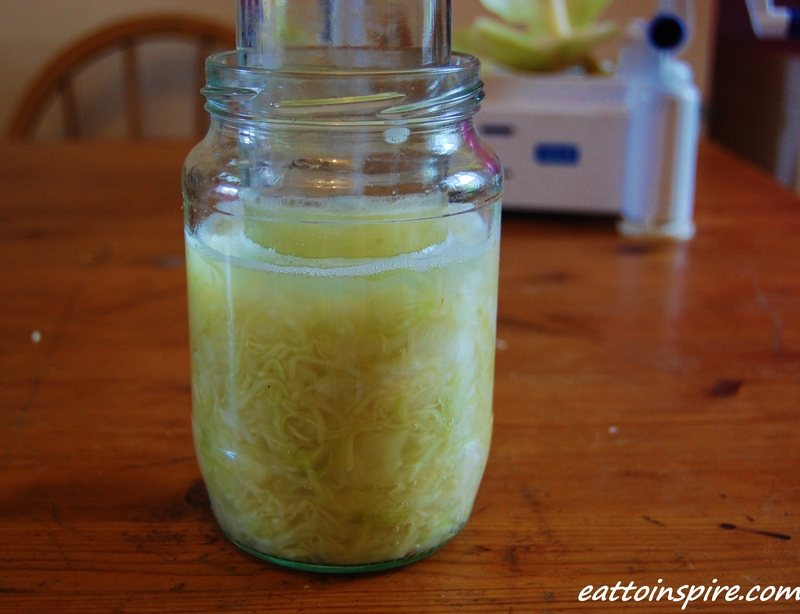 I shall share my sauerkraut results with you in two weeks when it is fermented and delicious! It’s amazing how easy it is isn’t it?! I haven’t done too much kraut, I’m keen to play around with adding other vegetables and flavours. I’ve been doing a fair bit of kim chi…my latest one looks alien like as I could only find organic purple cabbages at the time, haha.